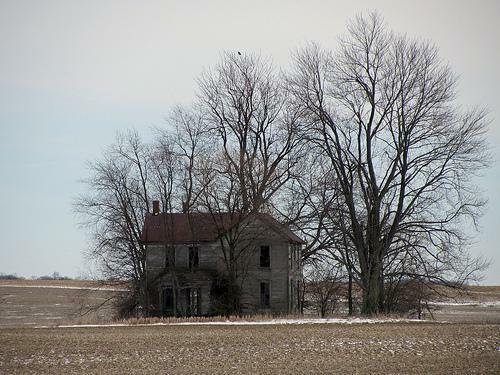 Across a blowing, windy, empty cornfield covered with a thick blanket of snow sat a small house. The colorless cube had been weathered with time and lack of concern. Two randomly-placed windows glared out untrustingly at the lonely vast surroundings. The fragile and tea-stained dressings behind the eyes of the home had not been pulled back in years, leaving the interior sheltered from any light the outside happened to have available to share. A scattering of dim, bare bulbs now served to illuminate the inside of the house. She was a miser with her resources now, but he didn’t mind waiting to inherit everything after she was gone. He walked through the house along one of the few pale trails that had been worn into the dark stain of the hardwood floors. One path led from the kitchen to the living room. Though the furnishings showed evidence of nobility and intentional placement, the color had since been drained from all fibers in the furniture and the worn carpet and the thin curtains that covered one of the two windows in the house. A fine layer of dust was the proof that the intentional placement of all furnishings had not been disturbed, down to the copy of TV Guide that sat in the same spot on the once-regal coffee table from years prior. Another path led from the living room to his tiny back bedroom. Long ago, it was a nursery, filled with love and light, but now the baby blue paint was peeling off the walls and the picture frames holding past remembrances of joy were cracking at the corners. A large stuffed bear, given with affection, had lost his smile along with an eye and sat on an old chair much too small for an adult. A sweat-stained mattress broke the room’s pastel palette and a tattered blanket with baseball players barely visible lay crumpled in the middle of it. In a small area between his bedroom door, the bathroom door, and the back entrance of the kitchen was a nest of a bare spot scarcely noticeable due to the lack of a bulb in this insignificant square. It had served as a garage for toy cars when he was a child. It was also a guard shack, prison cell, hospital room, ice cream stand and, later in his life, the creaking tattle-tale that announced his early morning entrances to his sleeping mother. The floor still creaked every time he took the step or two through it, though he was no longer sneaking. The bathroom had been paid the least attention to over the years, but definitely had the largest contribution to the smell of the tiny abode. It had been ages since his mother had been out of her bed, and so the amount of scum that had accumulated across all of the porcelain made the fixtures look a filmy grey rather than the sparkling white that she used to insist upon. The odors wafting from this room only slightly covered the stale, burnt offerings of the tiny kitchen. When his mother was mobile, the meals that were crafted gave the whole house a mouthwatering aspect that was often different but always comforting. Some nights it was onion and cilantro; other nights, rosemary and oregano, or perhaps cumin and turmeric. She made everything taste wonderful. Now, a small stove held uncleansed remnants from meals of yore as well as a warm pot of stew that offered insight into its flavor via bland visual presentation. The smell was more sour than sweet and more bitter than spicy. Tan droplets slopped out of the pot onto a table that served as a division between the kitchen and the living room. A plastic tub of a powdered, concentrated cleaning product sat near where a bowl of soup had just been stirred. He was taking the bowl of lukewarm sludge along the final path in the house. A path so worn the splinters would often pierce through the bottom of his foot whether or not he was wearing slippers. The road to his mother’s room was one he could have walked through a hurricane blindfolded and reached without incident. He had walked this path in all of his emotions: love, hate, sorrow, sympathy, joy, pain. No matter what emotion he was expressing, this stretch of the small house always seemed impossibly long. It was an extension of the house so removed that at times it seemed like she was more of an omniscient being of faith rather than flesh and blood. When he reached the closed door to the entrance of her room he paused and the whole world around him seemed to pause in unison. The sound of the harsh wind had momentarily subsided and he could imagine himself the only mobile object in a world paused in time. The house seemed unnaturally still as he balanced the warm bowl in his left hand and rested his right against the cool finished wood of the door. His mind raced through a library of vivid scenes from his past that all happened where he was now standing. He felt his breath becoming more shallow and fast. He was beginning to change his mind. It took an unusual amount of pressure to push the door and as he did, a gush of air swelled around the door from inside the bedroom. His unkempt hair blew back and the sound of the wind picked up singing in cacophony with the chug of the oil furnace kicking on and the blower starting its low roar. As he stepped into the room it smelled sweet like the fermenting of rotten fruit. The floor creaked as he walked toward the bed and he could see her quiet face in the dim light of the lone bulb in the room that was lit on a table beside her bed. He set the dish on the table and as it hit the wood top, her right eye exploded open and the white around the cold blue iris flashed against the dull shadowy bedroom. He sat in the only other piece of furniture in the room—an old, feeble rocker. It was the same one his mother rocked him in when he was an infant. It creaked methodically against his weight as he sat down and looked into her unwelcome glare. They locked gazes for a moment and he could hear her long wheezing breaths over the sound of the wind and the furnace blower. The sound of her voice broke the rhythm of her breathing. It started out as nothing more than a cracking sound. Her purplish lips parted, smacking with sticky muck webbing in the corners of her downturned mouth. With another wheeze she motioned as if she were speaking but the air leaking out from her windpipe did not have the force to cause a noise. Instead, her once-soft lips writhed like earthworms across the grey wrinkles of her face. With another effortful breath, she finally managed audible speech. She always said good morning when she woke from a nap, no matter what time it was. And she always called him boy. She was his mother; it only made sense that in her eyes he would always be a child. In fact, he was shamefully reliant on her even as she sat barely alive in her bed. Sixty years after birth he was still sucking nourishment from her as if the cord had never been cut. He knew that would all change the moment she passed away and all of her resources became his. He grinned slightly as his focus shifted from his mother’s stare to the steam rising up from the bowl on the table between them. “Good morning, Mother. Hungry?” His voice was not much clearer than his mother’s from an equally insufficient lack of use. She closed her eyes slightly and smiled. Her smile used to comfort him. She would delight in watching him play and discover and grow. But when his excursions began to take a darker turn—when he began coming home with cigarette smoke on his breath and whisky spilled down his shirt, when he would not come home for days until he had run out of money or just needed a place to sleep—her smile began to change. It became a smile of distrust and acceptance at once. They both knew he was up to no good and she was going to love him forever anyway. He stood as she smiled at him and walked over to the far side of the bed to help adjust her pillows and sit her up. He could have thrown her across the room if he had wanted to, she was so light. But instead, he slid her gingerly up as if she were a child and tucked her thick soft quilt around her. The colors in it had faded a great deal but he still recognized the patterns from childhood clothes: the corduroy pants he tore while ice fishing, the jacket that got stained from picking and eating too many wild raspberries, the shirts he outgrew from kindergarten to graduation day. He walked back around the bed to his chair and their eyes locked cheerfully for a moment. She truly loved him and had since the day he was born. She blamed herself sometimes for the way he had turned out. She only wanted the best for him—like any mother would want for her child. She gave him everything she could and when he wanted more, she found a way to provide. And when he still wanted more, she found ways to sacrifice herself in body and soul to make sure he had everything he wanted and thought he needed. She loved him, but was ashamed of what he had become. Where she had thought her provisions were being distributed in order for her son to provide for a future generation or generations, they instead turned out to be providing for his own selfish whims. When she was younger, she would trick herself into thinking that her son’s solitary existence was due to lack of good company, but she had grown to understand he had no intention of sharing any of his life with anyone, and yet was still thinking he did not have enough. The bitterness inside her would swell up at times and, though she would try and contain it, begin to spill out. “Is that smell you or my lunch?” she said. This took the smile off of his face and reminded him of his current agenda. He sat down in the chair and sighed. A fly that had somehow become warm enough to take flight buzzed lazily around his head. He swatted at it and responded to his mother with an unoriginal “I’m sorry I could never be as good of a cook as you, Mother,” and waved the fly away with his hand and a scowl. He grabbed the bowl and scooted his chair closer to the bed in order to administer her last meal. “God, Mother!” he spat, and slapped the bowl onto the table causing small, thick drops to splash out onto the table. This was her way. About the time he was fed up with her, she would show her kind, loving side. “I do love myself! I just wish—” The fly interrupted by tickling the end of his nose. He snapped his hand at the bug in such anger that if he would have been off-target even a fraction of an inch, he would have broken his own nose. However, his target was skillfully hit and both people in the room looked at his fist in impressed surprise. He moved his gaze to his mother who was still staring at his buzzing hand with raised eyebrows. Her eyes lifted to his. He grinned and lifted his fist to his ear and shook it, causing the trapped fly to buzz louder. Without blinking, he closed his fist tightly and the buzzing sound was replaced by a soft crunch. He opened his hand palm down and a small crooked dot fell to the floor leaving a miniscule stalactite of goo hanging from his hand. He wiped his hands on his shabby pants and leaned forward in the rocker, moving closer to his mother. “Open wide now…” He opened his mouth at her as he would an infant and she responded by mirroring him almost as sarcastically. He tipped the spoon in her mouth and her wrinkled grey lips closed around the silver stem and held firm as he gently pulled it back out, empty. “It is yesterday’s.” He scooped another puddle and she received it just as happily. He looked at her questioningly. “I know that isn’t a word but I don’t know how else to describe it.” She smiled and opened her mouth. It was that smile. She knew. He stirred the bowl a round or two before feeding her another scoop. He was unable to take the same amount of joy as he had before. He was a criminal caught in the act, but still allowed to continue. He became unsure of the outcome, questioning her and questioning himself. He fed her more and she began to hum as she ate and smiled. He was led away from his reckless thoughts by the soft sound of her voice. It didn’t take long for him to recognize the tune, though he couldn’t name it or its composer. “What song is that?” He tried to remain cold as he asked this and fed her another spoonful. She paused momentarily and her smile changed from one of knowing distrust to one of genuine love. “Ah, boy, that is Mozart. LA-da-DEE-dee-Da La-da-da-da… You used to love this as a child. I would hum to you and you would calm down immediately no matter how sour you were.” She gathered up her arms as if she were holding a bundle close to her. “Serenade No. 13 in G major. It was no wonder you took to it. The song is just like you—full of pomp and circumstance, yet swaying into lighter moments of sorrow.” She started humming again and hugging herself. He stopped serving her for a moment and looked upon her as she drifted off in song. He saw how beautiful she was. Her silver locks had the same curl they always had. The light of the small bulb in the room reflected off her hair and made it glow as it circled around her head like a large halo. Her skin, in this light, began to lose its shadows and appear smoother and younger. “DEE-dee DEE-dee dee-dee dee-dee-dee, lee-dee-dee-dee-dee-dee.” He looked at her lips as she hummed and the color had faded to a soft pink in the strange lighting. He was mesmerized by her and came to the realization that he was killing the thing he loved the most—that he needed the most. The humming stopped and quickly took the glow from the room with it as she opened her eyes and coldly looked at her assailant with welcoming open arms. “More please.” She opened her mouth like a baby bird. There was no turning back now. The damage was done and he felt at this moment as if he owed it to her to finish the job. And so he did. Spoonful by spoonful, he slid the toxic sludge down her throat as she hummed and smiled and swallowed. It only took a minute or two for the bowl to be empty and she closed her eyes and sank satiated into her pillows, humming Mozart with a wide grin across her face. He stood up with the empty bowl in one hand and smeared spoon in the other looking down at his mother as the chair behind him rocked, tapping the back of his calves. He walked out of the room and closed the door behind him. In shame, he never looked back. Instead, he walked straight to the kitchen and threw the bowl in the sink with a crash. He stared down into the sink at the three large sections of bowl littered with similarly colored slivers and chunks. The bright blue bottle sitting on the counter next to the sink caught his eye. Before he could even feel one speck of remorse, he grabbed the bottle up and buried it deep into the already mounded trash can. He pulled his empty hand out and used it as a compacter, leaving enough room for at least another day or two’s worth of garbage. Just as instinctively, he moved into the living room and sat on the couch. He felt sick to his stomach. He nested his face in his hands and massaged his cheeks, his eyes and his forehead. He had expected to feel like celebrating and instead he felt like he was grieving. Though nothing even had the chance to be different, he was lost with no idea what step to take next. Everything in his whole life had been dictated by his mother and now she was gone. He heard her from the bedroom as if she were screaming in his ear. He leaned in close to his mother and took her soft hand up with his trembling one. As he leaned into her, a tear dropped from his eye and splashed upon their entwined fingers. “Boy.” Her voice was so soft he could barely hear it and closed in to the point that their foreheads were touching. Suddenly, her eyes opened wide and she began to let out an inhuman scream. Her mouth opened like a chasm and through the squeal, a projectile spray of flies flooded out of her body and swarmed around him like a cyclone. He covered his ears to protect himself from his mother’s alarming wail but it could not protect him from the cloud of insects that spun around him creating a visual cocoon. The screaming became his own as tiny bits of his flesh were torn off here and there before quickly unraveling tissue and shredding it into invisible-sized morsels. The house shook as if ravaged by a hurricane. The gray haze of the twister turned an odd shade of pink for a moment and through the veil, the boy’s skeleton could be seen with bony hands still clasped to the side of his skull. As quickly as the skeleton had appeared it collapsed into a pile of dust as the swarm dissipated and everything began to go beyond normal into an unusual state of calm. She let out a sigh and closed her eyes. Her lips came together and started humming Mozart again. A tiny belch slipped out and she pushed herself comfortably back into her pillows. Humming and smiling, she drifted off into a peaceful slumber. When she opened her eyes, the sun had finally broken through the clouds and sent a bright shaft of light through the bedroom window that illuminated the whole room into the hallway outside. An instinctive smile spread across her face and she easily sat herself up. She wiped hair from across her face and noticed as she did that it had returned to its more natural golden color. Staring out the window, she brushed her hand against her cheek and could feel how smooth and tight her skin was. The draw from the beauty of light outside was too much to ignore and she flung the covers off with a zest she had not known for years—decades even. She swung her legs over the side of the bed and sat looking down at them before she put her feet to the floor. The taut pale skin reflected the incoming sunlight and made her legs look even more youthful than they had become. She slid herself down, placing weight on her delicate feet that wobbled from lack of exercise. Her rubbery legs shook as she lifted her body weight onto them. She took her steps toward the window like a newborn foal, arms outstretched toward her target. Her fingers clasped at the curtain when she had reached her destination. She stood clinging to the deep red velvet fabric and stared out the window. The sun was casting its light over the rippled waves of snow that spread across the surrounding fields. Her eyes squinted as if seeing light this bright for the first time. Icicles that hung down from the edges of her home’s roof were glistening and dripping in the heat of the new day. She placed her hand across her torso and felt the warmth inside her of a new beginning. She closed her eyes and smiled and hummed. Soon it would be spring. This entry was posted in Issue 14:1 and tagged Contest Winners, Dead of Winter, Fiction, J. Chad Kebrdle by TC Editors. Bookmark the permalink.